Game review: Instructions Weren't Clear Enough. Can Someone Guide Me? Instructions Weren't Clear Enough. Can Someone Guide Me? Ohaider everyone, Mash is here today with another review. I'll be reviewing a game called Guideline. It's a PPG made by Epicosauruss. I'll be calling him EpicO throughout the review because I can't really be bothered to write his full username. I'm actually still in shock and wondering why EpicO doesn't have any features. I thought he had some, but I guess I was wrong. Since he has some MS positions, I sort of assumed that he had some features as well. Well anyway, I don't know him and his game making style at all so I guess this'll be a breath of fresh air for me. I have no idea how this'll turn out, but let's hope it's good. Now, onto the review. You guys might be very surprised at what I'm going to tell you all. It's nothing too big, really. Anyway I'm pleased to inform you all that playing Guideline makes one feel very dumb and also, I was unable to even pass the first level even after around 13 attempts. But walkthrough videos are always there to save you, so that's okay. (To the people that love making walkthroughs for their games, I salute you and thank you.) I doubt anyone would be able to pass the first level without asking EpicO first. At first glance, Guideline looks like your ordinary neonish puzzle platformer game that everyone LOVES to make, myself included. But what makes this game different from the rest is that, you'll have absolutely no idea on what the heck is going on. You'd pretty much try to move your character a bit, but after that you'd be stuck on what to do next. You'd probably be just so dumbfounded. Your mouth would probably just swing right open saying: "What?" There wasn't a storyline given for this game, so I guess you just help this man get to the other side. It sounds easy enough, but it isn't. The playing field of the game isn't large, everything is visible. But it's still very confusing, it'll take a long while for one to be able to distinguish the goal and what you have to do to get to these goals. "Finally, a game that isn't 9 levels or more!" was actually my first thought when I stumbled upon this game. Though this time, I think that this game is a tad bit too short for my taste. Oh well, nobody's perfect. Anyway the gameplay was alright, except for the fact that you'd just end up bewildered on your first go at it. This would probably be your first reactions as you start the first level: "Oh, so that's what the blue things do, and the circle is shootable..." "Oh, I can control that?" "How do I win?" "Which man are we talking about?" You'd probably be asking more, but I'll leave it at that. I think the instructions of the game are to blame. They really weren't made clear enough for anyone to really understand completely. But once you do start to understand the whole game, you'll be in for a ton of fun. This game is absolutely a joy to play through. It was really fun, you can tell by how much times I had to use curse words. My mother almost even came in the room while I was playing, thank God she didn't. I'd be screwed. (And yes, I'm not allowed to use curse words. But I secretly do. #Mashisbadass Ironically, my mother curses a lot though she tells me not to.) Despite the game being very confusing and very short for my personal taste, I found Guideline to be a very fun game with pretty consistent gameplay. The placements that Guideline had were pretty so-so. It was organized and all, but it wasn't exactly flawless. But I think there was a little too much going on, and I also think that's the reason why it was so difficult for others to be able to understand the game completely. Going out of bounds, reaching the time limit to complete your task and avoiding the occasional red blocks in this game seems to be the thing you really have to look out for, as well as your skill when it comes to controlling your character as fast and as precise as possible. One slip up, and you're going to be forced to repeat the whole level. I especially enjoyed the placements of level three. The 'gravity flip' used in that level made it even more worthwhile. Plus the map was pretty spacious and there wasn't too much things going at the same time, so it was a lot easier for the player to focus on his/her objective. The level after that however, was the one I disliked the most when it came to the placements. You know that the blue blocks are switches, but why does there have to be so much? And for some reason, it was still possible to hit the ones that were blocked by even more blocks. Why is that? It just looks and is confusing. You immediately have to take action once you start the level and if you didn't know that you'd lose instantly. It's kind of unfair in my opinion. As for the design, it's the same with the placements. So-so. The overall design of Guideline wasn't bad, it didn't hurt my eyes or anything but it just wasn't my cup of tea. One thing EpicO could have improved on with the design is how everything looked. You couldn't distinguish what was this to that. The red circles flip your gravity, but you wouldn't know that. You'd think it's a hazard, like the red block. This is also something that made the game really confusing. It's one of the main things that brings this game down. It looks alright but I've seen similar games that look a lot better than this. 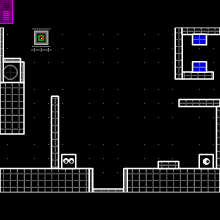 It isn't the most creative game in the universe since it uses that cliche neon design that's been going on ever since the beginning of the Physics Puzzle Creator because it's easy to do, yet very pleasing to the eyes and it could look somewhat minimalistic as well. I personally am very fond of this kind of thing, but I'm also getting tired of it. As for the concept of the game, I guess it's relatively new, but it just wasn't executed in the best way possible. EpicO could have done a better job on that as well. As I said earlier, they were so-so and not exactly perfect. -Nothing too new can be seen in Guideline. This game is extremely fun and addicting. It was too difficult for others to play. To put it in simple words, Guideline is just your average PPG. It wasn't anything too special. One word to perfectly describe this game is so-so. Almost everything about this game seemed average, it didn't really stand out to me. Unfortunately, I don't think this is worthy of a feature. However, I still do recommend that you guys play this game. Once you understand it, you'll have a blast. EpicO, there are a lot of things that you have yet to learn. In the future, I do hope to see some more improvement on you games. I hope that the next time I review another one of your games, it won't end up to just be 'so-so'. I do believe that you'll get a feature in the near future. Thank you all for reading my review and I sincerely don't know why this review seems so formal compared to my other reviews. This is Mash, about to wonder what to do with my life now since I've just finished writing this review and watching the whole of Black Lagoon.